Spend Less Time on File Conversion! 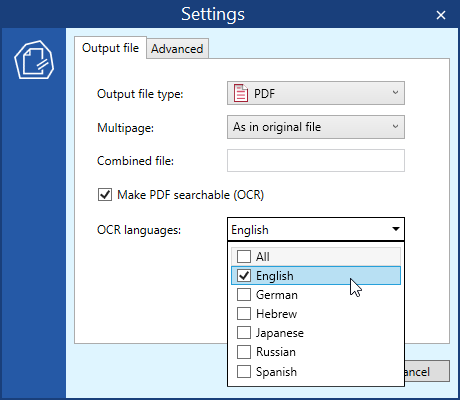 DocuFreezer is a software for converting documents to PDF (.pdf) , JPG (.jpg, .jpeg), TIFF (.tiff, .tif), PNG (.png) or XPS (.xps) formats in batch mode. Now you don’t need to open each file and export it to the desired format. 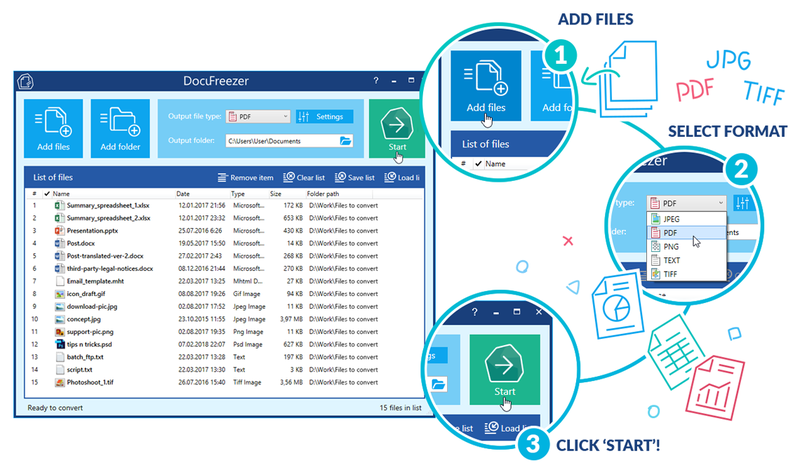 Instead, just drag-and-drop your files onto DocuFreezer main window and click “Start”. DocuFreezer allows you to convert a variety of file types in batch mode. If you usually convert the same files on a daily or weekly basis, file lists may come in handy. 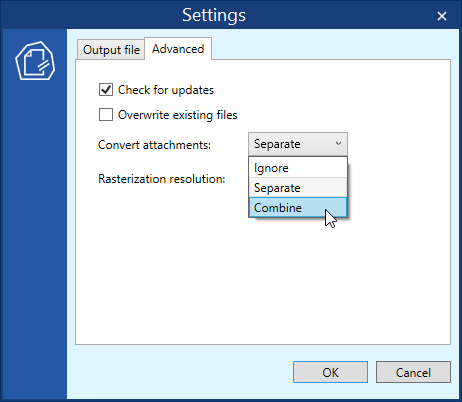 Just add your files to the program's list, arrange them in the right order and click Save list. DocuFreezer will create a separate file — File list (*.flist) which can be used over and over again by clicking the Load list button. You can import, export, clear lists and remove items from the lists. 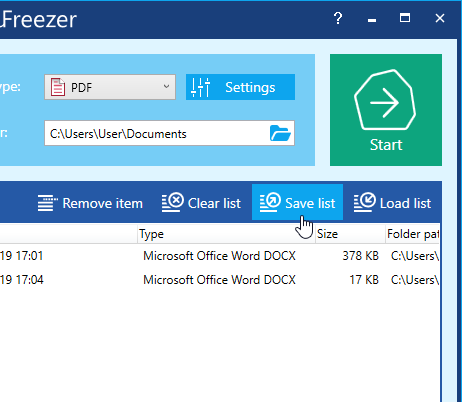 DocuFreezer can merge various files into PDF or TIFF as well as split and combine PDF or TIFF documents and add new pages to existing documents. You can also set the name for output files via Combine file option. Conversion of multi-page TIFF to PDF and vice versa is also possible. All in batch mode! You don't need to extract files your files in compressed by WinRAR (.rar), WinZip (.zip), 7-ZIP (.7z) or another archiving software before adding them to DocuFreezer list. Simply add an entire archive to the list and click Start. 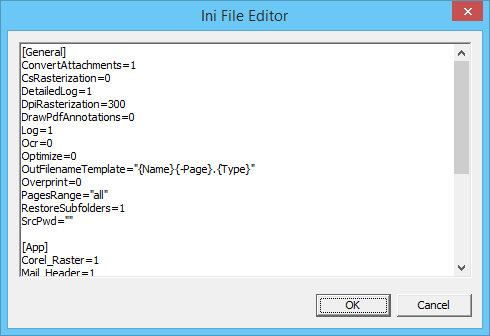 Some advanced settings can be modified in the program's Ini File Editor. To edit it, open DocuFreezer main window and press Ctrl + Alt + I on your keyboard. Each line has a variable value which can be changed. If you are not sure about a specific setting, please contact us!